If you’ve never seen the film “Objectified” by Gary Hustwit you really should. Throughout the film, industrial designers are always lusting after creating the perfect chair. For some strange reasons calendars are a graphic designer’s version of an industrial designer’s chair. It seems silly, but just a quick search and you’ll see how many different calendars there are online. Everyone is trying to create their own version, always trying to improve on how we pass the days. We’re even guilty of this, we created a nice template for a business card year calendar. All this still hasn’t stopped us from designing and making other calendars. On a daily basis, we probably use 4-5 different calendars, each in a slightly different way. In the office we have a wall calendar which only shows week days. On there we add upcoming events, deadlines, birthdays, holidays and other important milestones. This works well as a visual tool for the whole office. It is very glancable. Each member of the team also has a single A4 sheet of paper with the entire year on it. 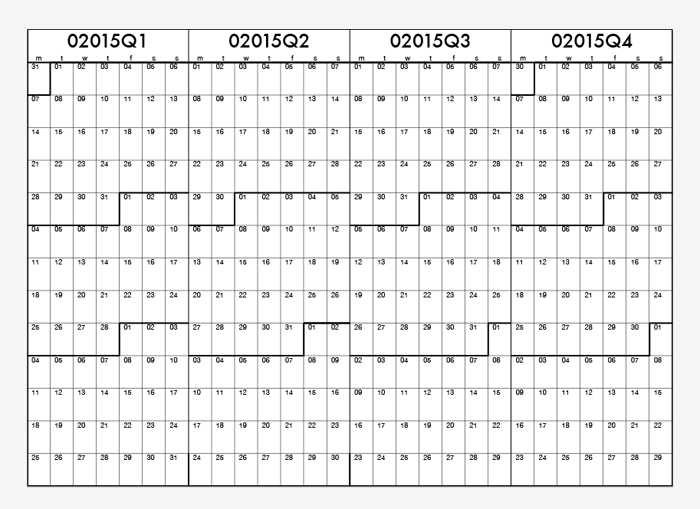 This is divided into 4 columns, one for each quarter. It folds-up nicely into a skinny bookmark style calendar. This allows you to focus on the current quarter. We do several things on a quarterly basis; our contest, mailing list, a few internal things like paying VSK Tax, etc. Having this overview and a physical artifact that you need to “turn the page” on is a good remind of the other tasks that need to be done as we move from quarter to quarter. We’ve also been experimenting with small A7 pocketmod style booklets. These are A4 sheets of paper folded in half a few times to form a small book. This gives you 8 pages: 6 internal, plus a front and back cover. Again, this is ideal for a small quarterly calendar with a facing page of notes for each month. With two simple rubber-bands and three sheets of A4 you can make yourself a nice small book by binding them together. First you take the first and third notebooks and fine their respective centerfold spread. Placing the first rubber band in between pages 4 and 5 in the first booklet and 4 and 5 in the other, it forms a ring holding them together. The problem here is that they can still fall out. Adding a third booklet, this time in-between the two others makes a sandwich. Nothing is holding this 3rd, middle booklet into the bunch, so the second rubber band is used. Through the centerfold in this new middle booklet, we wrap it around the whole bunch. Our first rubber band holds laterally the 1st and 3rd booklets in the bunch together. The second rubber band holds the 2nd booklet in the middle vertically as a spine around the other rubber band. This makes a nice snug fit where nothing will fall out. It is a simple system that works nicely as a set of three books. This booklet is a great pocket reference that can be carried around, notes scribbled into it and todos written than would’t fit on the A4 Quarterly calendar. 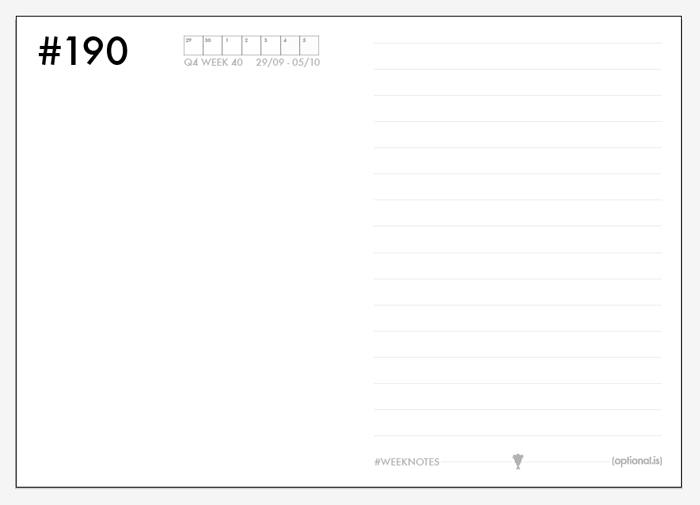 The other common calendar we are using in the office is for our A5 weeknotes. 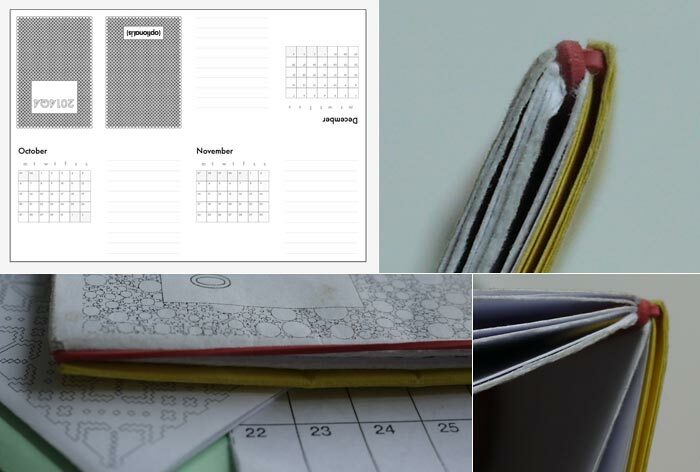 These are larger notebooks, that are customized both with the current week of the year and a small week calendar, but also with our company’s week number, the number of weeks old the company is. We are currently in week #185. It was that many weeks ago that we incorporated the company. This example page is for week 190 in Q4. It is the 40th week of the calendar year from 29th of September to the 5th of October. It has a small week calendar covering these days. We use the left side of the notebook to jot down some of the things that happened during the week. We also tend to make notes about things to include in the weeknotes post. On the right-side, the lines are used for goals for the week. When we meet we talk about what we’re planning on accomplishing in the next 5 days. We write these down and the following week’s meeting we review and transfer over any loose tasks. The large pages and short range of one week, help-us keep track of what’s been happening right now. They are a good way to document the short-term. 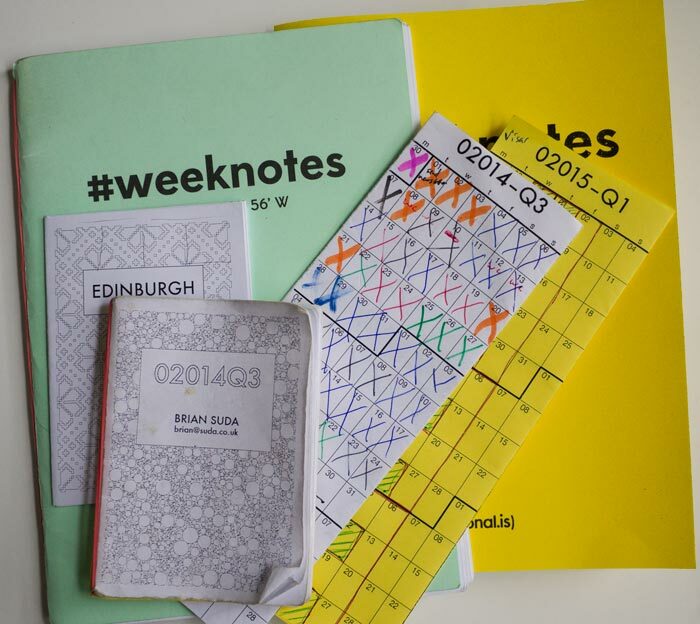 The weeknotes are split up into quarters as well. There are several reasons why we do this. Firstly, size. A quarter is 13 weeks, so each notebook is 26 pages after folding. A year’s worth of pages wouldn’t fold in half easily. We are using the rubber band trick again to hold the small 26 pages into a heavier cover. This way we can have a few A5 quarter booklets bound into a single cover. Using the rubber band means we can keep upgrading the pages to the current next quarter without getting new covers. The thing about having 13 weeks means that we have one extra side of a paper. We use this for a Quarter cover page, but also the last page of each quarter is a nice notes page. Here we collect thoughts throughout the quarter that will go into our quarterly newsletter. The early prototypes were designed by hand. We spent hours in Illustrator doing layout and updating the month boxes for each quarter. Once the design settled down to something we liked, we started to replicate the design in code. We use PHP to generate SVG. That SVG can easily be edited in Illustrator if we want to change anything or it can be printed directly. We are always improving on our calendars to keep us organized and we want the world to get organized too. That’s why we’ve open sourced all the code which creates these files. You can download it, change the dates, switch the date that your company was incorporated and make your own calendars. Since we are trying to standardize on week numbers, it means that we are following the ISO 8601 date and time standard. This means that weeks start on a Monday. Therefore it will certainly clash with some cultures. Iceland for instance called Thursday Fimmtudagur, which literally translates into the 5th day. Starting on Monday means that Fimmtudagur is the 4th day of the week, not the 5th. Thursday originated from the Old English “Thor’s Day” and somewhere along the line Iceland dropped their Nordic connection and went with “5th day” instead – probably when the country cast-off their pagan ways and adopted Christianity in the year 1000 where Sunday was regarded as the first day of the week. There is a long list of possible future improvements. We are already asking for the year and quarter, and sometimes the company incorporation date as input. We have also considered asking for the latitude and longitude. This would get us other data points such as sun-sight and sun-eclipse. We also considered tidal times, but that probably doesn’t make sense for most places. It is also possible to overlay a lunar calendar, but until we use that for something it seems like extraneous information. We also considered a URL for an iCalendar file. We could pre-populate dates on the calendar with local holidays or planned events. For us, writing these in manually is easier than maintaining the code.